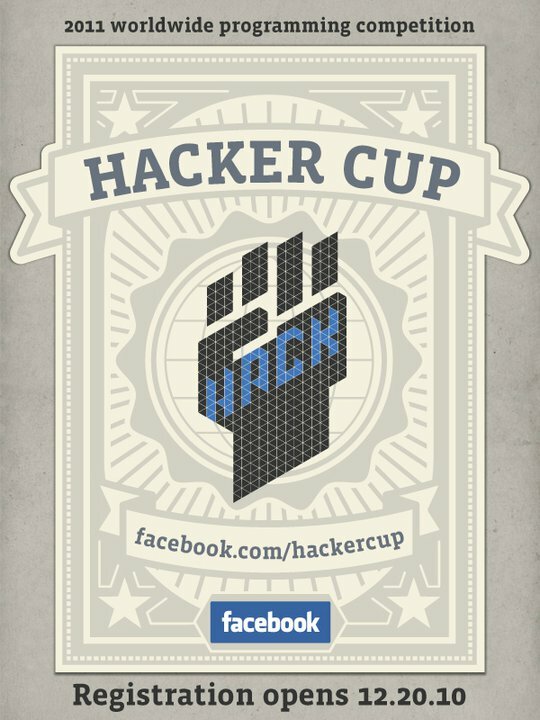 Get Ready Hackers ~ Facebook 2011 Hacker Cup ! Hacking is a central part of Facebook's culture. Whether we're building the next big product at one of our Hackathons or creating a smarter search algorithm, we're always hacking to find a better way of doing things. We're starting the Hacker Cup to bring engineers from around the world together to compete in a multi-round programming competition. Contestants will have to successfully solve algorithmic-based problem statements to advance and are ranked by accuracy and speed. What: An annual algorithmic programming contest open to hackers from around the world. Where: Three online rounds with the finals at Facebook's headquarters in California. When: Registration opens December 20th with the three online rounds occurring throughout January 2011. World finals to follow. Finals: We'll pay to fly and accommodate the top 25 hackers from the 3rd online round out to our campus. Prizes: Of course! $5,000 USD and title as world champion to the top hacker, $2,000 for 2nd place, $1,000 for 3rd, and $100 for 4th through 25th. Awesome t-shirts for the top 300 hackers coming out of the second online round. Thousands will enter, but only one will emerge as world champion. The competition commences with a 72-hour Qualification Round on January 7, 2011 at 0:00 UTC (4:00 PM PST) to January 10, 2011 at 0:00 UTC (4:00 PM PST). All registered competitors will be presented with three problems. Only competitors who correctly solve at least 1 problem will advance to Online Round 1. Online Round 1 consists of 3 sub-rounds, each lasting 3 hours in length that are offered at different times from January 15, 2011 at 15:00 UTC (7:00 AM PST) to January 16, 2011 at 0:00 UTC (January 15, 2011 - 4:00 PM PST). Competitors who advance to this round can participate in any of the three sub-rounds until they qualify for Online Round 2. The top-scoring 1,000 competitors from each of the three sub-rounds will advance to Online Round 2. Online Round 2 begins January 22, 2011 at 15:00 UTC (7:00 AM PST) and will end on January 22, 2011 at 18:00 UTC (10:00 AM PT). The 3,000 competitors will have three hours to solve the presented problem sets. The top-scoring 300 participants from Online Round 2 will receive an official Hacker Cup t-shirt. The top-scoring 25 competitors from Online Round 2 will be notified via email that they have advanced to the final round at Facebook. Facebook will fly the top-scoring 25 competitors to Palo Alto, California, for the final round of competition on March 11, 2011, where they'll receive some great cash prizes and other awesome goodies. Out of these 25 finalists, one champion will emerge and be immortalized on the Hacker Cup trophy. Keep an eye on the Hacker Cup page at www.facebook.com/hackercup for more announcements as the January 7th qualification round approaches. May the best hacker win!